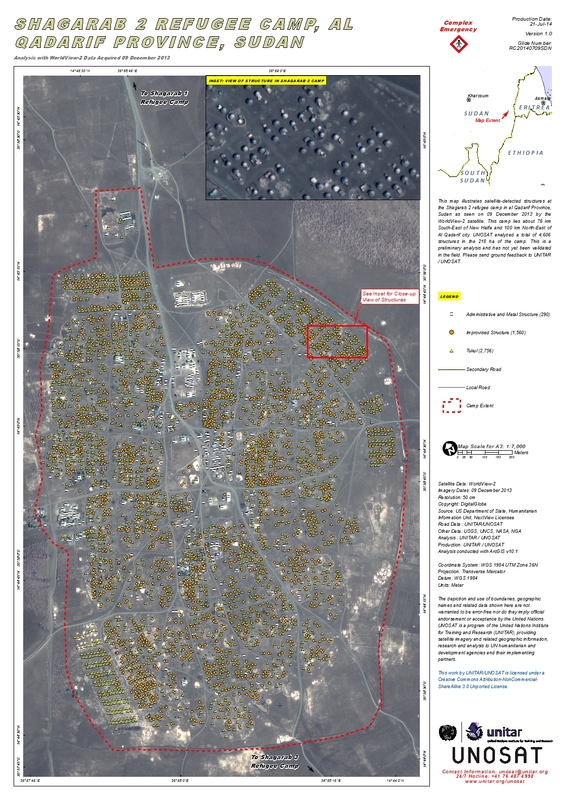 This map illustrates satellite-detected structures at the Shagarab 2 refugee camp in al Qadarif Province, Sudan as seen on 09 December 2013 by the WorldView-2 satellite. This camp lies about 76 km South-East of New Halfa and 100 km North-East of Al Qadarif city. UNOSAT analyzed a total of 4,606 structures in the 218 ha of the camp. This is a preliminary analysis and has not yet been validated in the field. Please send ground feedback to UNITAR / UNOSAT. Analysis conducted with ArcGIS v10.